For most of us, ice cream is among the most sought-after pleasures of summer. 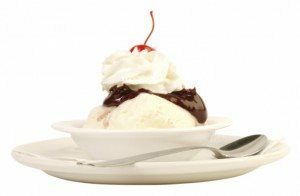 Many of our childhood memories revolve around going to a favorite ice cream parlor for a hot fudge sundae or triple scoop cone. Why not create your own grown-up treat? Your kids will no doubt want to have some too. Here’s one of our favorite summertime indulgences, made with Italian waffle cookies called pizzelles. It’s sure to be a hit for many summers to come! 1. Dip each pizzelle into the hot melted chocolate. Place onto cooling rack and sprinkle with chopped peanuts. 2. Once set, place a scoop of ice cream into the center of each pizzelle. 3. Drizzle hot fudge on top of ice cream and place another pizzelle on top. 4. Place in the freezer for 30 minutes. You’ll find more delicious frozen treats for kids and adults at: http://www.foodandwine.com/slideshows/best-popsicles, http://www.saveur.com/article/recipes/spiced-persimmon-frozen-yogurt andhttp://sweets.seriouseats.com/ice-cream.